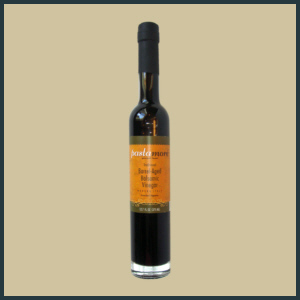 Our flagship product, this is pure Balsamic Vinegar imported from Modena, Italy. It has been barrel-aged in oak for 18 years, and as befitting a well aged balsamic, ours pours thick, is very concentrated, sweet and rich. 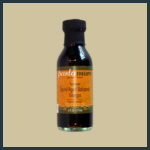 Balsamic Vinegar is the most famous vinegar in professional kitchens around the world. It is used in everything from marinating meat to a simple drizzle on berries for dessert. We love the amazing salad dressings easily created with it, or the flavor complexity added to steamed or grilled vegetables with the simple addition of a small amount. And do not forget to add a few drops to vanilla ice cream! Will order more for Christmas this year!!! Excellent base for vinaigrette. Tomato season can't get here soon enough! This is the best balsamic I have ever had, other than that really old stuff I had in Italy many years ago. I like to finish mushrooms with this when sauteing them. Also, a base for salad dressings, marinades. I'll just dip bread in it all by itself. I go to this one and your white b. with pear all of the time.